Fighting a lifelong battle against obesity made me feel like Sisyphus; the character from Greek mythology who was doomed to push a rock up near the top of a hill, only to have it go back down the hill. Through a process of education, good systems, great advisors and focusing on the positive, optimism has replaced a lifelong feeling of impending doom. Before last year, I was a streetwise consumer, but a sucker for numerous quick and easy weight loss gimmicks. Then I would be overwhelmed with “failure syndrome” the first time that anything would go wrong. If I gained a pound, I would give myself permission to gain 10 more. It was the opposite of how I reacted to anything else in life. It was like I had been taken over by a body snatcher, that was determined to leave my health in a state of chaos. It was time to kick the body snatcher out. I had reached 377 pounds and far past the point where they consider you morbidly obese. I was 55 years old and my health issues were starting to impact my relationships, my businesses and the rest of my life. I was on my way to a miserable and reasonably quick death, but still buried inside was that part of my personality that truly believes that anyone can achieve anything if they put their minds to it. That “can-do” mindset is back on the front burner. I made a plan and implemented it. My father was a professional gambler and I have a secondary career helping lottery winners with their finances. I picked up a few things from a lifetime of watching gamblers. One is that I am always looking for an “edge” that will help my side of any calculation. I do research, study and weigh the odds. When I see an opportunity, I immediately go “all in,” like a poker player would. I put all of my resources on a decision and live or die with it. If I have done my homework, it ought to work out. I had weight loss surgery even though my health insurance would not pay for it. I recovered from surgery with a detailed plan that included changing every aspect of my life. I share parts of the plan in the Brand New Man book, but recognize what worked for me may not work for everyone. In a world full of unique people, I am more unique than most. Each person has their own set of goals, character traits and values and needs to find a plan and experts that work for them. People can learn from my story, but I don’t offer many hard and fast rules. Rules need to have consequences when they are broken. The enthusiasm and courage that I draw from the experience of the last year has made me better at what I do and happier about who I am than any other time in my life. I call upon strengths that I never knew I had and keep pushing the envelope of what I can be. I don’t know what my upward potential is, but I’m going to keep pushing until I get there. At age 56, a point in life when many people are looking at slowing down, I’m kicking into a new and faster gear. In describing how I got to this point in my life, I draw literary inspiration from the great philosopher from Margaritaville, Jimmy Buffett. He gets most of his biographical highlights into a witty and insightful four hundred word essay. My dad was a bookie and my mom worked in a potato chip factory. Everyone in my family was overweight and died at a young age. I was fit in the first grade, but we moved to the suburbs and my parents got divorced. I got chunky and picked on, and someone tried to cram cottage cheese down my throat. Then I had an early growth spurt, and I became a decent athlete. I did well academically my last year of high school and became semi-popular. My skewed childhood gave me a sense of ambition, self-confidence and determination tempered with feelings of exclusion, irony and empathy with the underdog. College at Eastern Kentucky University was wonderful, and my nonstop activity balanced my diet of fast food, soda and frozen pizzas. I stayed at a good weight for five years. I started gaining 10 pounds a year in graduate school at Vanderbilt. I was at 270 in 1989 when I went to a liquid weight loss program. I lost 90 pounds and eventually gained it back. I did the program several times, never lost less than 50 pounds and gained more every time. That went on for about 25 years. I’ve slept with a CPAP for 20 years, been on blood pressure medicine for 30 years and stalled the move to insulin by staying on a low carb diet. I rarely drink, don’t smoke and don’t do illegal drugs. I travel frequently and have been to zillions of nice restaurants, but kept the stockholders of McDonalds happy along the way. I was married, divorced and married again. I started my own “fat guys” group. We stayed together for several years, but no one really lost weight. A hypnotist got me to stop eating potato chips. A shrink helped me deal with my childhood traumas, sudden family deaths and anything else that was bugging me. 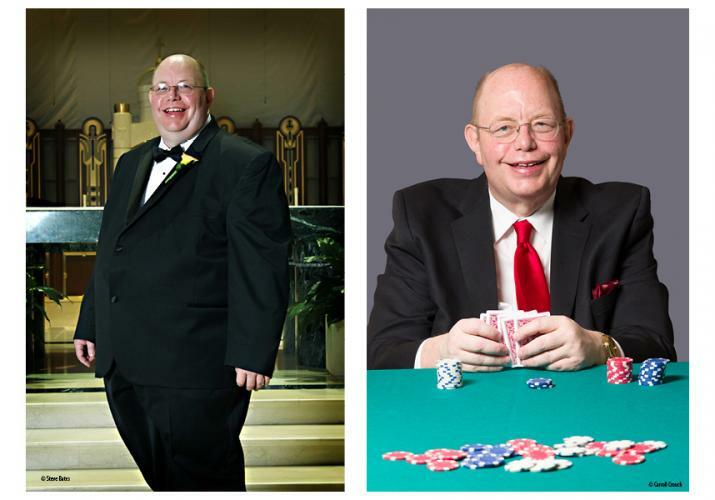 A personal trainer helped my 377-pound body exercise, and I read over 100 books on nutrients and diet. I became friends with some of the best doctors in Kentucky and occasionally listened to them. I led a productive, high-profile life, but at age 55, my body was falling apart. Then I did weight loss surgery. I lost over 110 pounds. I started eating correctly and taking lots of vitamins and supplements. I exercised daily. I embraced Crossfit. I even tried cottage cheese. The highlight of the post-obesity era was a race that I lost. There were roughly 3,800 people in the 2015 Midsummer Night’s Run 5K, and I came in absolutely dead last. But with huge blisters on both feet, I finished. The picture of me crossing the finish line is one of sheer ecstasy. Twelve hundred Facebook friends and a Huffington Post audience liked the picture, and they also gave me tips on socks and shoes that prevent blisters. I get invited to all kinds of events designed for serious runners. Even if I am traveling at a slow pace. Don McNay, CLU, ChFC, MSFS, CSSC, is a best-selling author and former syndicated columnist who lives in Lexington. He is the founder of McNay Settlement Group and is a structured settlement and financial consultant who serves as an expert in legal proceedings. His latest book, Brand New Man: My Weight Loss Journey, is being published by RRP International Publishing and will be available this spring. You can read more about McNay at donmcnay.com.